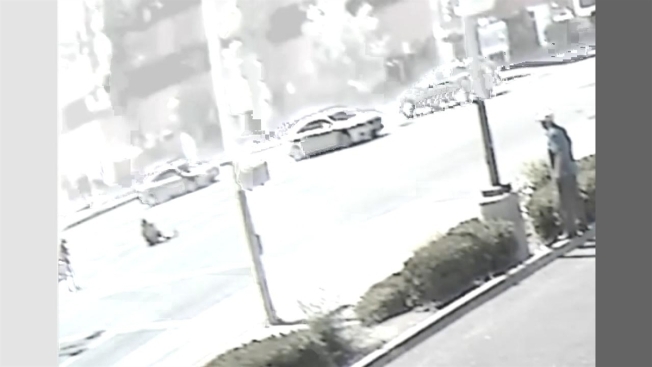 Surveillance video that captured a hit-and-run driver striking an 80-year-old grandmother was released Friday as police in Glendale asked for the public's help to find the person behind the wheel. The video taken Thursday shows a four-door black sedan driving north on Columbus Avenue about 12:55 p.m., according to the Glendale Police Department. The car can be seen turning right onto Broadway Avenue as 80-year-old Lousine Ghazarian walked across the street. The video then shows the front driver's side of the car strike Ghazarian, who fell to the ground, before heading east on Broadway. Ghazarian was cut on her right knee and hurt her right elbow and foot, police said. She was treated at the hospital and released. The driver was described by police as a woman in her 20s. Anyone with information should call 818-548-3131.